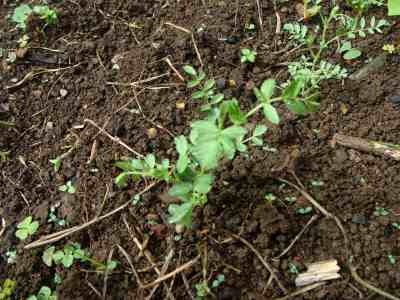 Growing chickpeas is a diary of fun in the garden. 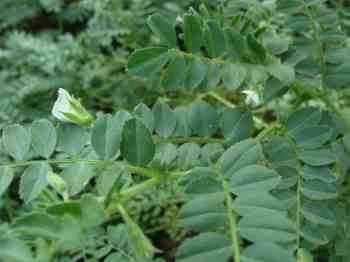 This Growing Chickpeas page could be a trial for you in the first weeks as it's going to be a diary in the art of growing garbanzo beans, aka chickpeas. I've never grown them before but they are hard to get here in my native South Africa. And they're expensive! So, I'm going to try growing them in our large garden. Why am I so crazy about Chickpeas? Because they belong to a group of what are known as "the superfoods" for lowering blood cholesterol. They are also rich in phytosterols: What are phytosterols is a question you may be asking. An important question, see lower down, and it certain has to do with growing garbanzo beans. Only a daily dip into our Quaker oats recipes is more effective in lowering cholesterol, and they may raise your blood glucose abnormally if you are insulin resistant, as I am. Chickpeas are also the very richest in B6 known as pyridoxine; it is used as a vital coenzyme in over 100 chemical reactions in the body, many of them to do with glucose metabolism. Together with three other vitamins, they are known as the anti-frailty group which help prevent this miserable affliction by a massive 260%. Chickpeas are rich in an essential amino acid called lysine. It's a difficult protein for the vegetarian to get, and a deficiency causes a very serious deficiency disease called kwashiorkor. It's common in Africa, and anyone following a vegan weight loss program has to be very careful to make sure they get adequate lysine in their diet. I'm not a vegetarian, but I love cholesterol rich foods like butter and full cream milk and ice-cream, and our mutton stew recipe; do you know what is mutton? And I absolutely refuse to eat margarine. Why? Hydrogenated foods are very bad for your nervous system. More to the point, cholesterol rich food lovers like me, and all the people taking lipitor should rather be balancing their diets with high fibre phytochemical foods that lower cholesterol. And, chickpeas are number two of the foods that lower cholesterol. So, I have to try my hand at growing chickpeas! Today, weather permitting I will prepare the ground, and with luck tonight I'll have some photos. First I have to reclaim the land from the jungle! Chickpeas and garbanzo beans are one and the same by the way. It's imperative to soak the seed. You'll notice in the pic below that not one seed in the middle row germinated. The first row grew so readily from soaked seed, that I thought I'd try an experiment. Trust me, soak the seed! 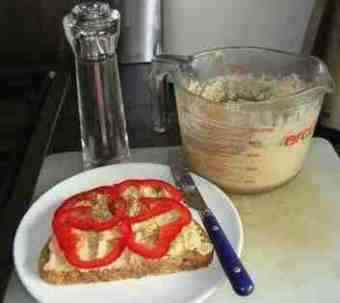 I just use the chickpeas that I buy for our authentic hummus recipe for seed. Soak them for 24 hours, perhaps use some to make hummus, and then spread the rest on newspaper, fold it over and cover, keep damp and place on a warm window sill. Within another 24 hours the seeds will be sprouting, and ready for planting. Meantime, shall we get on with preparing the ground? Currently we are using a minimum till method that disturbs the ground as little as possible. A tablespoon of vermi-compost from our work farms is simply worked into drill. Chickpeas are heavy feeders, so I recommend you dig a trench (do your back exercises first to loosen up! It's hard work.) 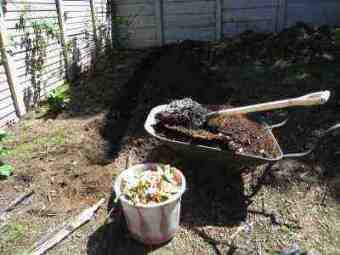 and fill it with compost, which is still used extensively. 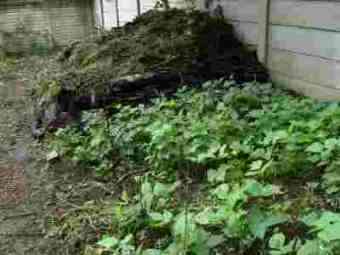 Update: Rather use your kitchen waste in making a compost pile than putting it directly into the trench. Oxygen is needed for proper degradation; anaerobically it will stink. 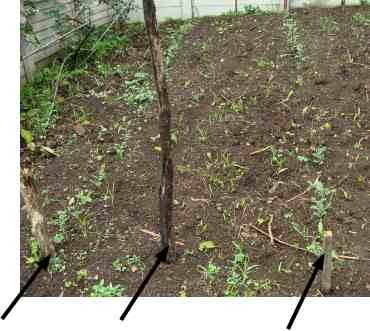 A crop of butternut squash from your waste may also threaten to take over your growing chickpeas as they've done in my sweet potato patch; see lower down. Mature compost and a pail of kitchen waste ready for the compost pile. A compost heap is a must for every serious gardener; in the large garden you can compost with old mouldy sticks too, or just use a compact compost tumbler in the smaller garden. It uses up all that garden and kitchen waste instead of sending it to the dump, and provides invaluable nutrients for your vegetables. Not to be confused, these are ordinary bush beans in the foreground below. Notice the missing row in the middle in the next photo. Germinating the seed first really is a must. Enjoy your beans and peas with butter or olive oil, by the way but never margarine, despite all the hype. Why? Our hydrogenated foods page tells all. Read too what this eminent heart surgeon has to say about foods to reduce inflammation. The young plants are fragile. I recommend you put a row of sticks to mark the them so you and the family don't step on them whilst negotiating the garden, and especially during weeding. They are very easily trodden underfoot. Are you on statins with all their nasty side effects? Have you been trying to reduce the contents of your medicine cupboard since you read about iatrogenic illness? Then this foods that lower cholesterol page is for you. Iatrogenic illness is the third most common fatal disease on the planet. Death in the main from medicines, but unnecessary surgery and hospital acquired infections too. There is one red meat dish that is not reared in a sty, feeding lot, cage or fish farm which makes the animal a whole lot healthier, if you enjoy meat and legumes like I do. Sheep almost always have the run of the hills. Same as us, if their diet is healthier, not in a corn fed lot, then they make tastier and better eating food. WHAT IS MUTTON? 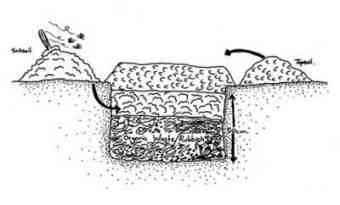 Cover your compost with soil that you've dug from the trench, subsoil first, topsoil at the surface. 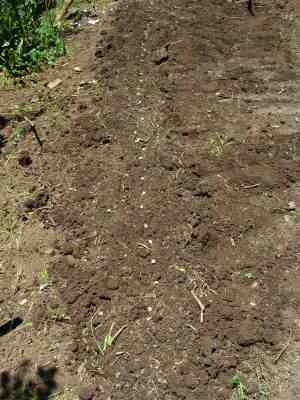 Rake it smooth and then make a shallow row with the garden fork for the sprouted chickpeas. A mistake I made was to plant them too shallowly. Then the plants fell over when they grew larger and I had to heap the soil up. At least 1" deep is best. Plant the seeds about 15cm apart. You can always thin them, but some won't sprout; rather a bit too thickly otherwise you'll have big gaps. 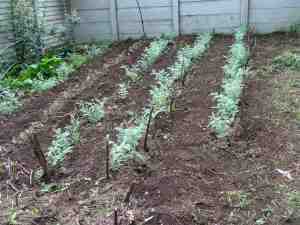 At least 60 to 70cm between the rows is best, otherwise weeding becomes impossible when they are larger. 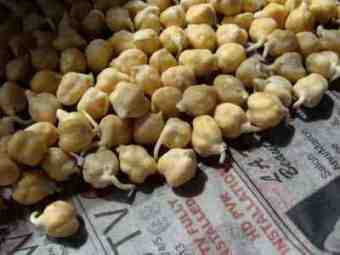 Eating and growing garbanzo beans is all about increasing the vegetable protein in your diet. There's heaps of research now showing a strong correlation between a high red meat diet and all the cancers, especially of the breast and prostate. Garbanzos are legumes which means they are rich in vegetable amino acids; the building blocks for our own protein. Plus legumes do a wonder for your garden because only they (I think) have nitrogen fixation bacteria that add the vital inert gas nitrogen to your soil. 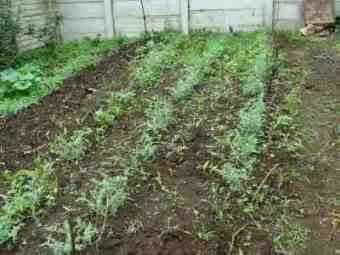 Just look at our crop of sweet potatoes mixed with butternut that followed this chickpea crop. Chickpeas, I've discovered have tiny leaves compared to a conventional bushbean. They're no competition for the opposition, unable to shade out the weeds. Weeding is essential. 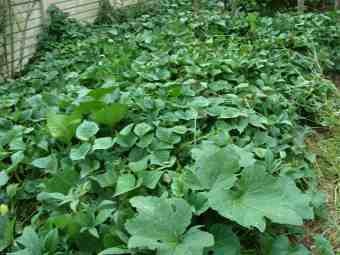 A aside: I used to hate weeding. Now I find it a chance to relax, mind in neutral; mind you don't pull a pea instead of a weed, not toooo relaxed! There's something very gratifying about a nicely weeded patch. If you look carefully, you'll see where I've had to replant the second row from the left 'cause those unsoaked seeds never sprouted. Notice the little sticks to help you mind the plants. Growing chickpeas was wonderful to have done once, but not again; it was an exercise in tedium and in future I will only be using dried garbanzos. Having said that, the green fruit was wonderful. The plants are now about a foot high and I've planted another patch, about 300 plants in all. They'll be coming out of our ears! Just the best food, plenty of plant protein, full of fibre, and antioxidants, and esp for animal fat lovers like me. Eat chickpeas and you can enjoy butter and cream and eggs without guilt. If you're following a vegan weight loss diet, it's effective by the way, then it's great to include chickpeas because they are so rich in that elusive for vegetarians protein lysine. 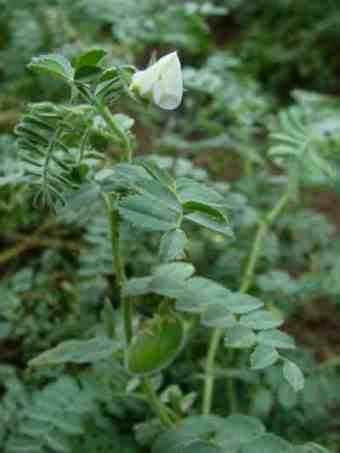 The growing chickpeas are suddenly awash with tiny white flowers, so small you can barely see them on the first photograph. Not sure, but I think it's the hot dry spell that has brought them out, more like a Mediterranean summer climate. The plants are quite big now as you can see. They still need weeding... a bit of a chore, but time to put the brain in neutral, never a bad thing. Sometimes I weed and think, and sometimes I just weed...! I'm watching out for the first tiny pods, that's where the amino acid lysine and all the phytosterols are to be found. Normally one thinks of chickpeas as dried food, but I'm told the green beans are absolutely scrumptious. Another few weeks... I'll keep you posted. Starting planning NOW, where you are going to plant your chickpeas in the spring. Soon, if you live in the north! Are oats really even better than my famous authentic hummus recipe for lowering cholesterol? Yes, they are, but you have to eat a lot of oats which is tiresome. I can easily enjoy a cup of chickpeas every day, but a cup of oats? Have both. I do. That's why my cholesterol is rock bottom without statins. This is, as stated above, new ground for me. I've never grown chickpeas before. But I've done a good deal of reading, and finally it was time to try my hand. Today, the first fruit. I've read that green chickpeas are definitely nicer than their dried counterpart which, if the truth be told, are rather dull without all the fruit and salad one adds. The family think I'm weird! I put on a pot to parboil ONE chickpea! And it was absolutely delicious. Sweet like an ordinary fresh from the garden pea. Tomorrow a real picking. Fresh veg is always tastier, and I suspect healthier than dried and frozen veg. 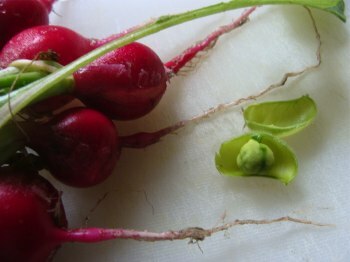 The first chickpea, with a handful of radish nutrition. Whilst chickpeas have been quite a lot of hard work, radish must constitute the easiest salad to grow in the garden, ready to eat in 3 to 4 weeks; and I use them to spice up our hummus. I'm assured that chickpeas are self pollinating, but I've seen the odd bee visiting the flowers. 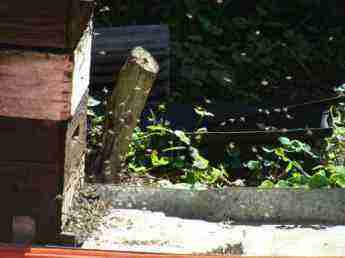 I'll bet next year, once my apiary is again established, that our yield will increase dramatically. Update: the apiary is established and we get huge crops of vegetables because of the pollination. Grandpa has a helper when it comes to podding peas of any sort, only most get eaten straight from the pod. 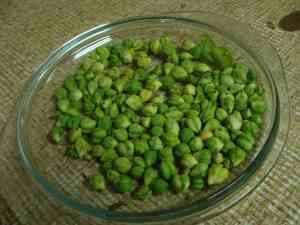 Lightly steamed fresh green chickpeas. AT LAST. Yes, growing chickpeas has been a long wait, over three months. This is my two-year old granddaughter who regularly visits the chickpea patch. 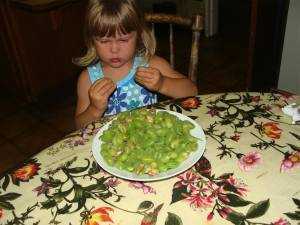 She prefers them straight from garden... but here they are shelled and lightly cooked. Delic! So sweet. I used them to make a hummus using both dried and green chickpeas. Make our own authentic hummus recipe in only four minutes. Meantime, if you are really earthy person and like to bake bread, this is the time to start practising making olive bread recipe. Delicious with all that hummus you'll soon have. OLIVE BREAD RECIPE is so easy if you have a bread machine. Not unlike life, eh, but some of those mistakes in life are often more unpleasant! Like taking a good looking job not knowing what a horrid boss you'll have. The honest truth is that next year I'll be growing chickpeas again, but only a small patch for my granddaughter. 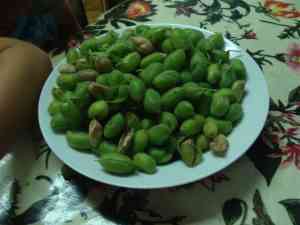 They have been a lot of hard work and, on top of that, just picking these pods, and shelling them, took over an hour. 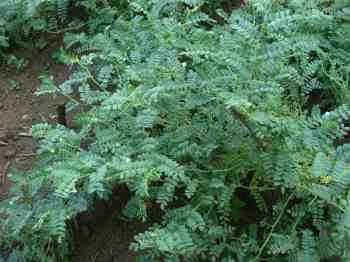 Delic and healthy though they are, with only one chickpea per pod, they need to be mechanically harvested. I'd rather put my energy into growing other legumes like pole beans and snow peas that don't need to be podded. And they obviously prefer a winter rainfall climate so, if you live in the Western Cape of South Africa, or California, give them a shot this Spring. Let me know how you get on. Plant early, once the danger of frost is over. They have a long growing season. 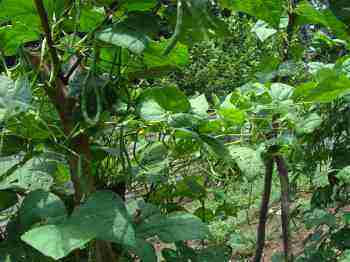 Growing green beans for example, especially pole beans, is a lot more rewarding. Now that it's late summer in the southern hemisphere, it's time to get pole peas in. I'll be looking for a variety that you can eat pod and all. Shelling peas and chickpeas is not for me!